After celebrating a successful first year in 2014, Iceland's Secret Solstice festival recently announced its initial dance lineup for 2015. 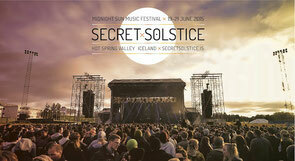 Secret Solstice was made famous last year for patrons being able to party in perpetual daylight for three entire days. Due to being held over the summer solstice weekend and longest days of the year in Iceland, this means the sun never ever fully sets, giving a spectacular natural backdrop and a crazy 24 hour daylight energy like no other. For the weekend of the 19-21 of June 2015 in Reykjavík, the festival has announced dance DJs including Moodymann, KiNK, Erol Alkan, Route 94, Daniel Avery, Submotion Orchestra, Zero 7, and many more as part of its initial offering for 2015, alongside well-known home-grown talent including GusGus, FM Belfast, Samaris, Hermigervill and more. Festival representatives say that this first offering is only an initial dance lineup, with a planned total of 150+ acts to be announced before the event that will feature many more mainstream rock, hip-hop, and pop acts.